If there was any doubt that Obama would eventually benefit from the Birther controversy, his campaign has just put it to rest. And with marketing panache. 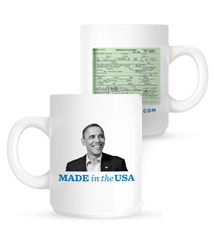 The Obama 2012 campaign is now giving away Birther merchandise -- t-shirts and mugs -- to donors who give over a certain amount ($15 or more for a mug, $25 0r more for a t-shirt). The merchandise features the president's face looming above the slogan "Made in U.S.A", as well as an image of his long-form birth ceritificate. "There's really no way to make this stuff completely go away," Smoot notes, referring to a new conspiracy book called, Where's the Birth Certificate?. " The only thing we can do is laugh at it," she suggests, "and make sure as many other people as possible are in on the joke." And as the donations pour in, Obama really will have the last laugh on the Birther issue.